My husband, Santosh’s, business has shut down for over a year now. 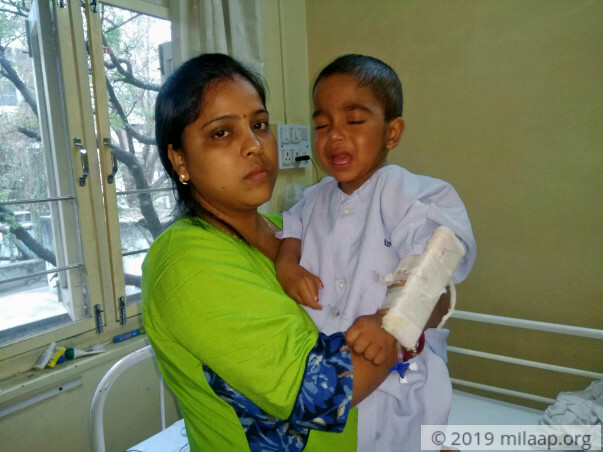 We left no stone unturned to arrange funds to save my younger son, Rishu who is just 2 years old. But it seems the cruelty of our fate is never-ending. Even after his successful liver transplant, he is sick again and is struggling to live. Mother of two wonderful sons, I have never bothered to look beyond my family. My husband had a small shop in Bihar which was our only source of income. He worked very hard to fulfil all the necessities of our children. 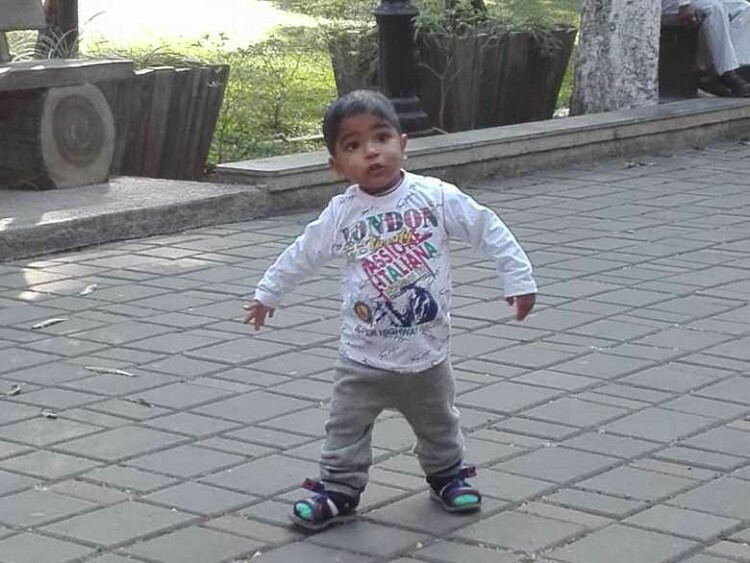 2-year-old Rishu, used to spend all his time playing with his elder brother Jayanth. 7-year-old Jayanth was more protective towards Rishu than we were. My husband used to say nothing made him happier than to return to a happy family. But suddenly things became worse when one day we had to take Rishu to the hospital. He had very high fever and had very frequent loose motions. In a matter of just few hours, my healthy baby was weak and crying. We took him to the local doctors in Bihar who gave some temporary medicines. However, the medicines were not working and his high fevers never came down. 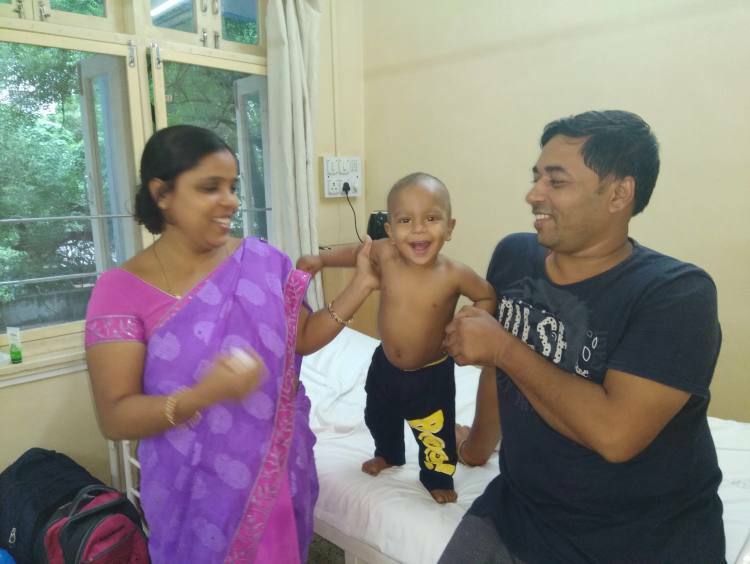 With doctors’ recomendations, we took him to Pune immediately. There we learnt that our little baby had liver cancer and liver transplant was the only way to save him. As soon as we moved to Pune, my husband’s business came to a standstill. There was no one who could look after the business for some days. The expense to carry out Rishu’s liver transplant was huge and it was very difficult to arrange the funds. The limited savings that we had was nowhere close to the required funds. We spent all of it. My husband’s brothers and a few other relatives were kind enough to help us sail through the difficult times. After his liver transplant, we thought that Rishu would be fine. We were happy to take him back home. While Santosh and I took Rishu to Pune, we had to leave Jayanth behind with his maternal grandparents. We didn’t want to hamper his education. Jayanth was so happy to get us back home. After going back to Bihar, Santosh restarted the business. Just when we thought things will be fine and we would recover from the crisis, destiny played villian to our lives again. 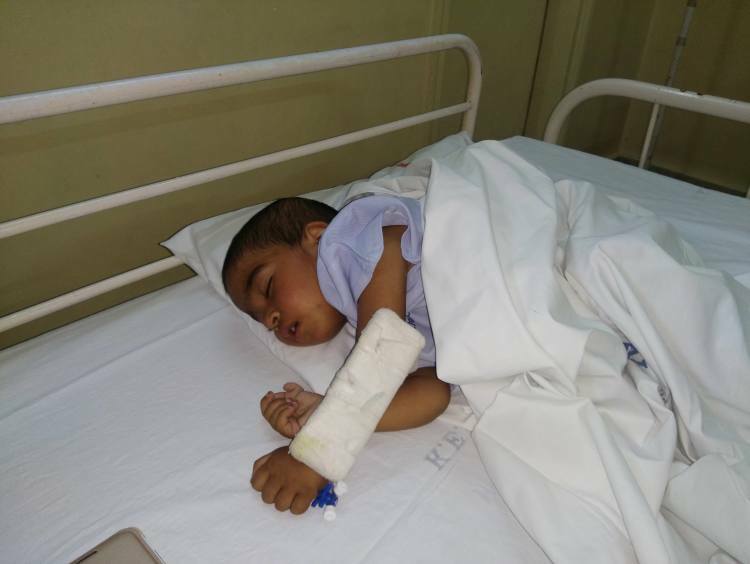 After five months of his recovery, Rishu started falling sick again. His fevers would come back every four hours. He started having severe motions. Sometimes he vomitted too. Our little baby was too worn out to fight back. I was shattered to see my baby suffer so much. Rishu’s sufferings took a toll on my health too. I devoted all my time and energy just to see my baby fine. Also, because we had no money, I started skipping meals. This worsened my diabetes condition. I couldn’t look at Rishu’s eyes. Being a mother, I felt maybe I should have done something to save my baby. I feel so helpless. 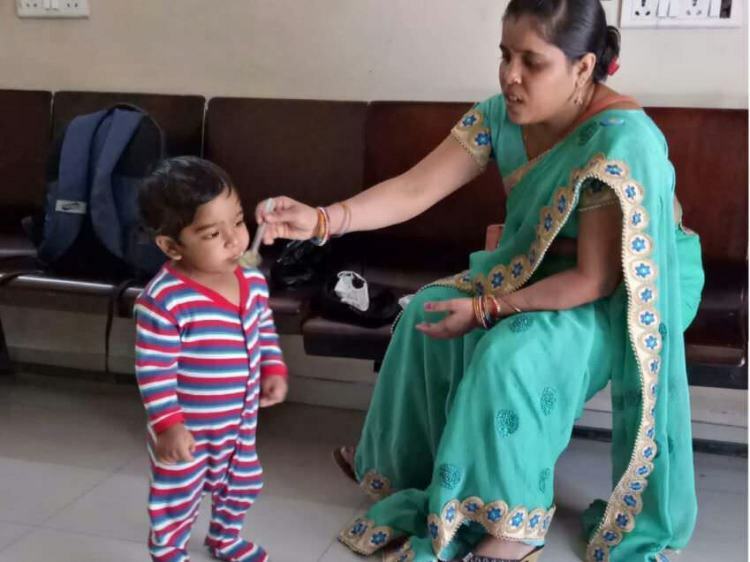 We took him back to Pune where the doctors revealed that Rishu has liver infections. The wounds after the liver transplant which should have healed by now, hasn’t healed for him. His liver joints are bleeding profusely and bodily wastes are causing internal damages. 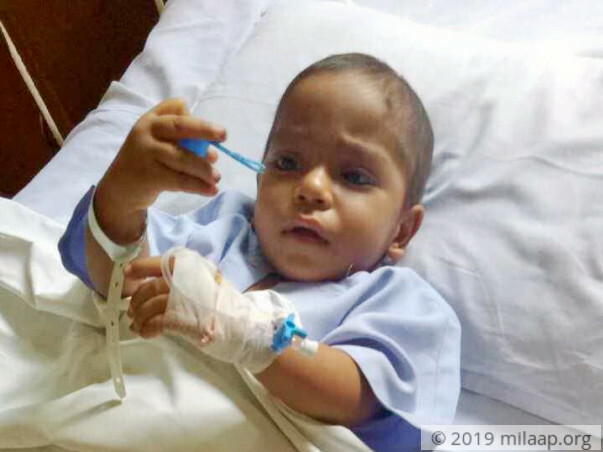 Rishu needs a surgery to fill the leakages of his liver. If the surgery isn’t done at the earliest, we might have to lose him. My little baby has become very weak now. He cries all day and refuses to eat. After the infection, he has lost weight. The recurring fevers and loose motions are taking away all his strength. He has already suffered way more than a baby of his age can. We are hoping that the delay in arranging funds doesn’t lead us to losing our little baby. Whenever we speak to Jayanth, he tells us that he is waiting to play with Rishu again. He is angry with us because we have not brought him with us. He says that he knows his little brother is ill and he would have loved to take care of him so that I could relax a bit. Neither Santosh nor I are able to come up with suitable answers for our little one. In the past one year, we have spent almost Rs 9 lakhs. For the past 21 days that we have been in Pune again, the bill has piled to Rs 2 lakhs. It is impossible for us to pay such huge bills. The treatments and the surgery that he requires now will cost upto Rs. 3 lakhs. We have no means to arrange the funds now. Only your support can help me save my son. Thank you for the love and support. Rishu is on his road to recovery. He has shown good signs of improvement. He has to visit the hospital once in two months for the follow-ups. He has been taking medicines as prescribed by the doctors. We would like to thank all of you for the love and support you have shown Rishu. Rishu is currently staying at a rented place in Pune with his family. 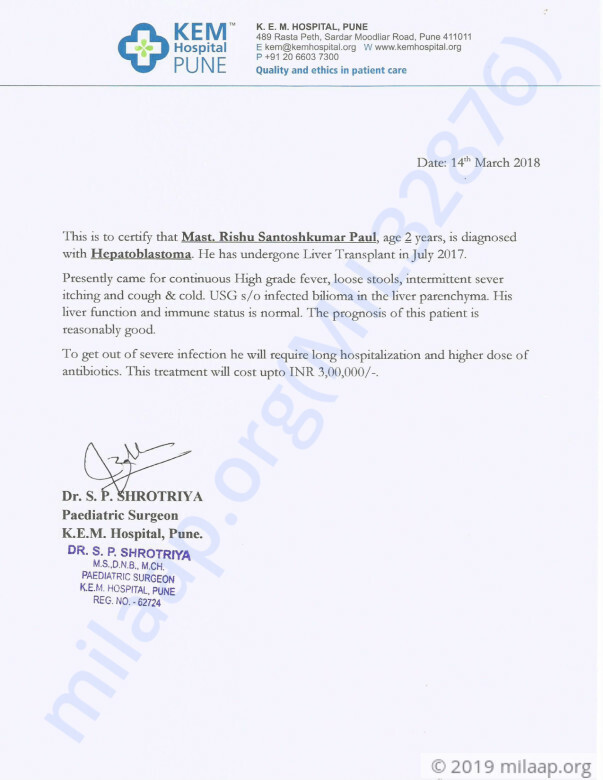 He got discharged from the hospital on 29th March 2018. His operation was successful and there were no major complications after that. However, doctors have advised to be more careful for next couple of months as his immunity is still weak. We are grateful to all of you who supported us selflessly. Thank you so much for the love and support you have shown Rishu. Withdrawn funds will be utilized to settle the medical expenses incurred during his treatment. Please pray for his early recovery.